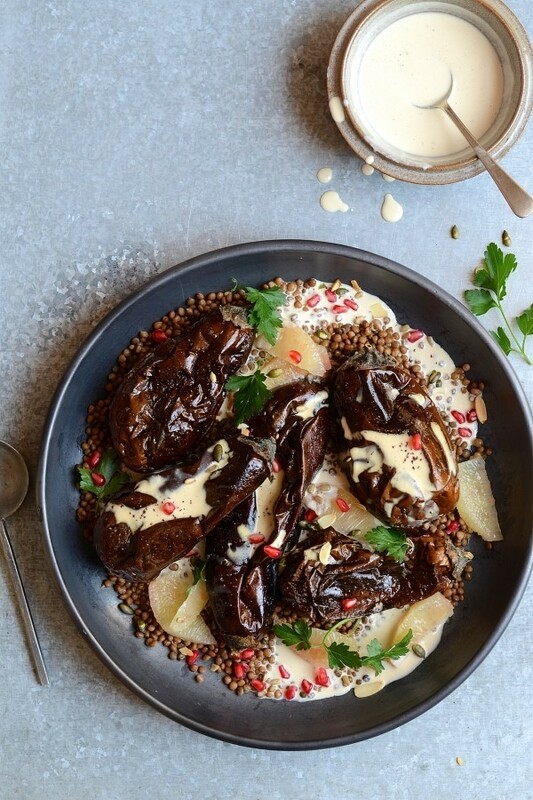 There are so many reasons to love these roast aubergines, not least of which is the miso and tahini dressing. It’s pares well with just about anything. I’d waver to say, it has the potential to drag even the most miserable of salads back to life. Underpinned with the unmistakably nutty taste of tahini, this creamy miso drizzle is my go-to salad dressing recipe. I first made it in one of my cooking classes and it’s been on repeat ever since. It’s addictively good. I like to serve these roast aubergines on a bed of lentils with pomelo segments and roasted nuts. With Heritage Day coming coming up on the 26th September, most South Africans will be headed outdoors to light the fires. I’ll be bringing this bountiful bowl of goodness to the table along with a fresh corn and halloumi salad. Although Braai Day is mostly about meat, I always like to offer salads with substance that cater for non-meat eaters as well. 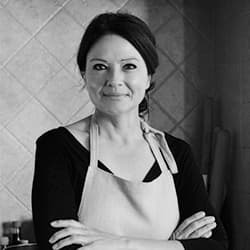 For me, memorable food needs to tick a couple of boxes. First up is always flavour, followed by some textural interest and colour. 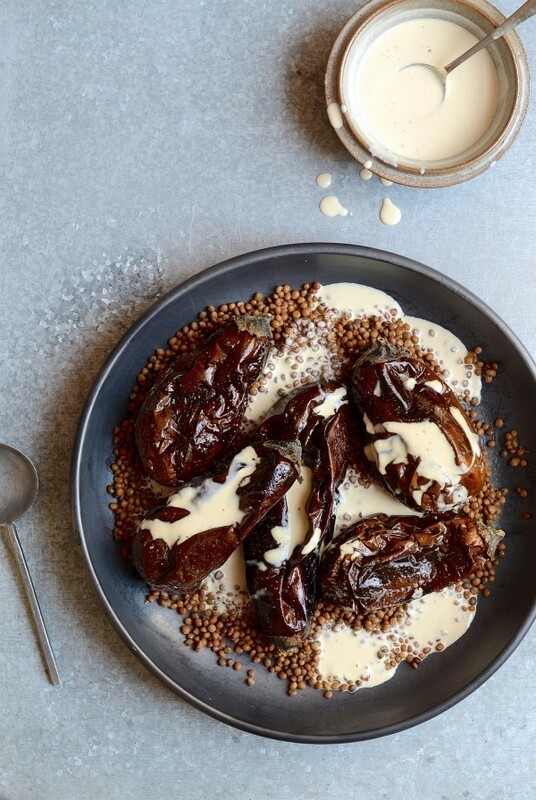 The combination of smoky aubergines with creamy lentils are typically Middle Eastern, so it goes without saying that tahini would be a fitting addition. If you prefer to keep things simple, serve the salad with just the miso and tahini dressing. Adding pomelo segments might be slightly unusual, but it lends a sweet citrusy tartness to balance the meatiness of the aubergines. For textural crunch, a handful of roasted nuts is a must. Aside from Baba Ganoush, aubergines taste best eaten warm, so I’d serve this salad shortly after roasting. Preheat the oven to 200º C and line a roasting tin with foil. 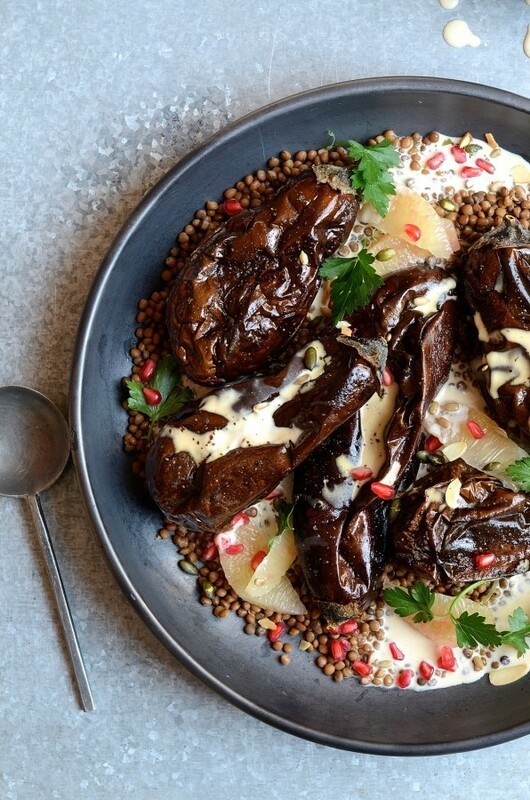 Drizzle the whole aubergines with the oil and season with coriander, sumac, salt and pepper. Spread the aubergines out on the tin and roast for about 90 minutes, turning them over twice during the cooking time. To make the miso dressing, place all the ingredients in a bowl and whisk until well combined and creamy. To serve, scatter the lentils over the base of a large platter. Pack the aubergines on top, drizzle liberally with miso dressing and finish with pomelo, nuts, pomegranate rubies.